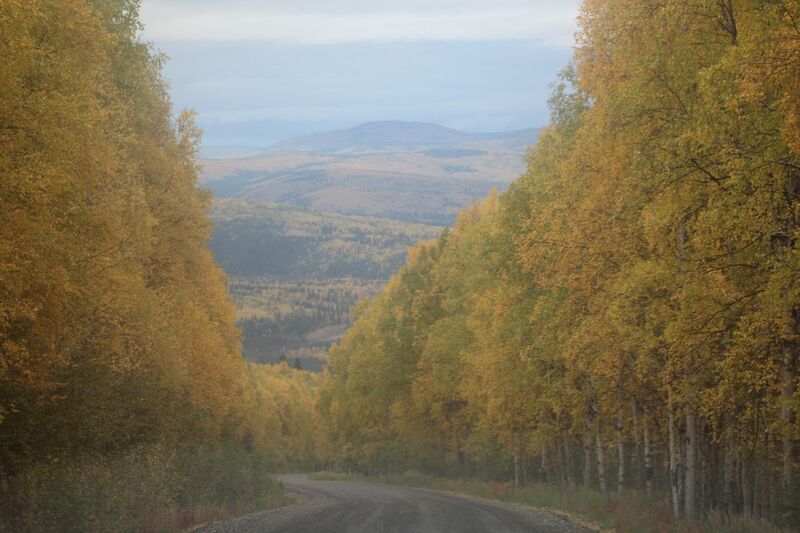 FAIRBANKS — As scientists gather in Fairbanks this week for a workshop on aspen trees — a misunderstood and often maligned species — the hillsides are cloaked in vibrant yellow. As the green vanishes and the birch and aspen leaves prepare to fall, one of the most striking things is how clearly defined clusters of aspen trees make the switch in unison. The timing is a function of an important subterranean system that connects what appear to be individual trees on the surface — one of the marvels of aspen trees. "Propagation from roots is common in aspen, constituting asexual reproduction," Ronald Smith writes in a natural history of Interior Alaska. "New saplings sprouted in this manner are usually still connected by their root systems to the 'parent' tree." Aspen clones are genetically identical, and besides a root structure, they share many other traits, from the size of their leaves to the moment when green chlorophyll breaks down and the yellow remains. "It is easy to see these clones on an Alaskan hillside in the fall when leaves are turning," Smith writes in "Interior and Northern Alaska: A Natural History." "All the individuals in a clone have the same genetic information for timing the yellowing and loss of leaves. "Nearby, unrelated clones often have slightly different genetic instructions for leaf yellowing. In September, you can see clumps of yellow adjacent to clumps of green or yellow-green leaves. Each clump represents a separate clone." A clone can cover an acre or up to 100 acres, the U.S. Forest Service says. A single grove may include multiple clones. "A clone may turn color earlier or later in the fall or exhibit a different fall color variation than its neighboring aspen clones, thus providing a means to tell them apart," the agency says. Most of the people who live in this part of Alaska enjoy the clones and their colors, though I can't write about this without mentioning the late Joe Vogler, a contrarian who was always at war with the powers that be, including the powerful aspen. Vogler, founder of the Alaskan Independence Party, always said he wanted a "peaceful separation" from the United States. He held the United States in such low regard that he insisted on being buried in Canada. He thought even less of aspen trees and tried to eradicate them from the subdivision he developed north of Fairbanks. That he would take his fervor about "arboreal weeds" to the Alaska Supreme Court showed that he was just as stubborn as he had been when he refused to back up for oncoming buses on the narrow Cushman Street Bridge. He went to federal court in 1948 to claim he was wronged by having to yield. That was an early lost cause for Vogler. The Forest Service says that aspen "is noted for its ability to regenerate vegetatively by shoots and suckers arising along its long lateral roots." Vogler would have said this was evidence of its inferiority as a species, one that couldn't be wiped out with a bulldozer. Vogler hated government zoning, but loved the idea of private covenants that restricted what property buyers could do with their land. On the lots he sold in University Heights Subdivision starting about 1972, he included a covenant ordering owners to "cut and destroy all poplar, cottonwood, and aspen trees." In the years that followed, he said, he "progressively asked politely, then more insistently, then demanded that various owners cut their trees as stated in the covenants." The land owners resisted. In 1981, Vogler went to court for the first time to force compliance, claiming that the people who bought property had mounted a "rebellion" against the covenants. "I believe if every lot owner in the subdivision were to work a little each year towards cutting and thinning out these trees, we would all be working toward the same goal and it would produce a more beautiful and more valuable subdivision each year," Vogler said in an affidavit attached to a later court fight. He lost and the aspens won. In 1988, the Supreme Court said that while 18 buyers had gone along with the anti-aspen campaign, a majority had never taken significant steps to destroy the offending vegetation. Ignoring the covenant was tantamount to abandoning the requirement, the court said. It didn't help Vogler's case that even on his own property, despite his best efforts at eradication, the arboreal weeds continued to grow. The aspen workshop this week includes a look at how the trees are growing today and what climate change, insects and diseases mean to their health. Field trips scheduled outside Tok and Fairbanks come with this warning: "Please wear an orange vest, jacket or hat during all field trips. It is hunting season!"